I was very excited and intrigued to try the hot new restaurant called Mourad that just opened up six weeks ago located inside the PacBell Building on New Montgomery Street in San Francisco. 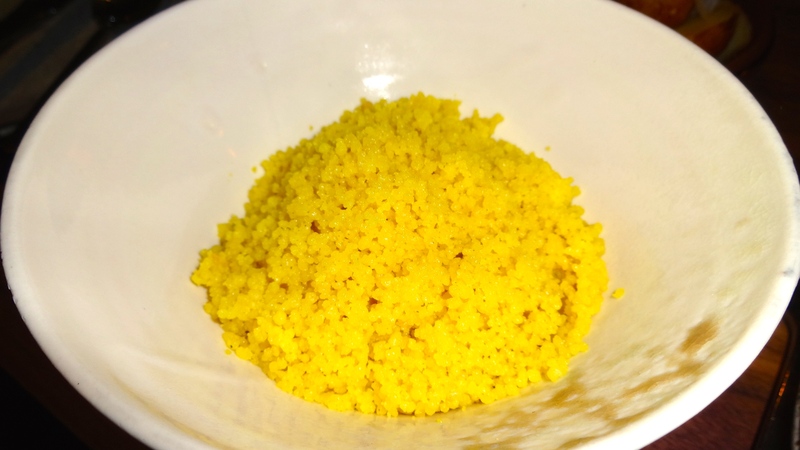 The chef, Mourad Lahlou from Marrakesh, actually has another restaurant in the city called Aziza, a one Michelin star Moroccan inspired restaurant (you can read my review here under my San Francisco post, be sure to scroll down towards the end of the post). 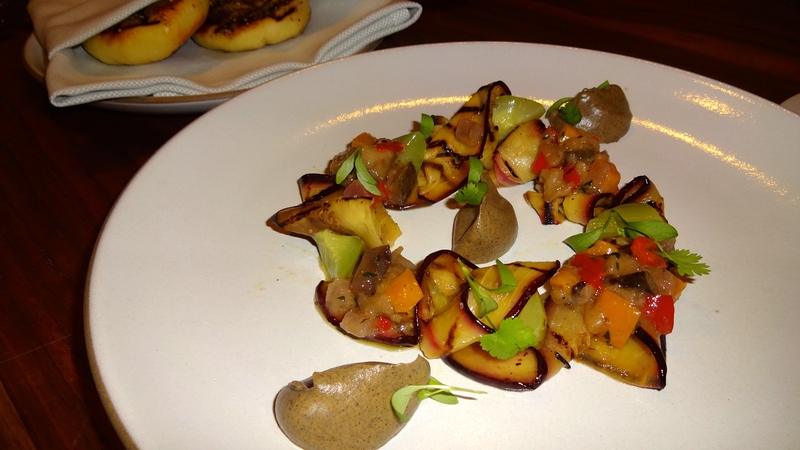 While Aziza offers more Moroccan inspired food, Mourad serves California cuisine with a Moroccan twist. Also the ambience between the two restaurants is quite different; Aziza is dark, warm, and intimate while Mourad is modern, sleek, and hip. All the dishes on the menu sounded enticing and unique. We ordered numerous dishes, mostly appetizers, to share family style. 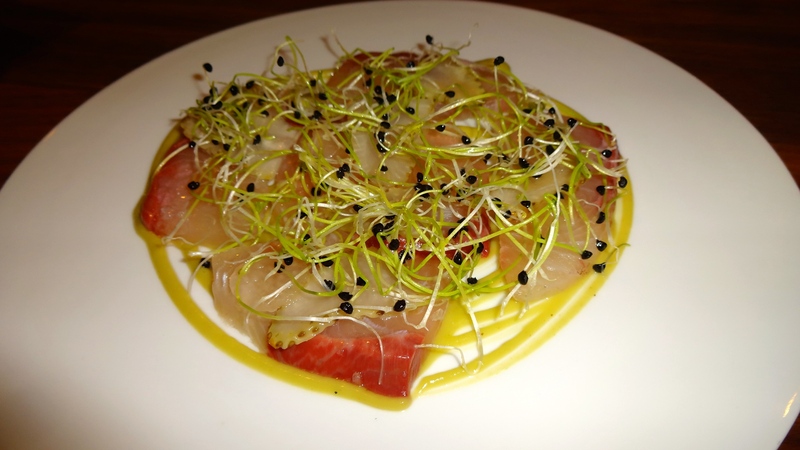 Kanpachi Crudo, Green Strawberry, Radish, and Onion Sprouts (8.5/10). 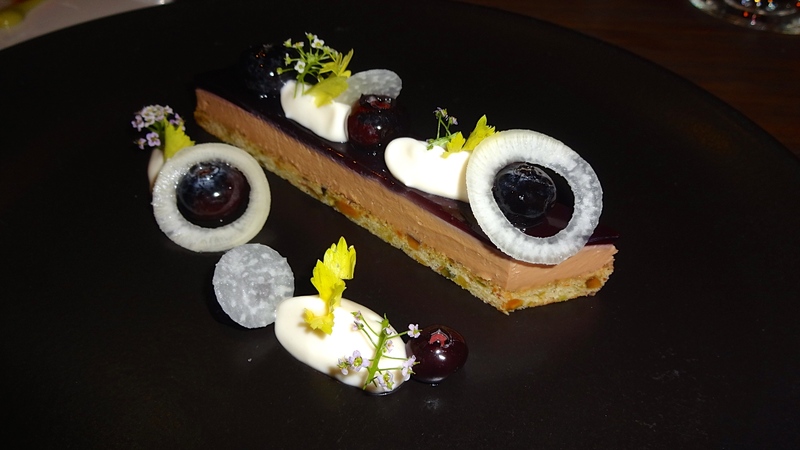 Duck Liver Mousse, Blueberry, Turnip, and Celery (8.5/10). Eggplant, Cucumber, Oregano, Pepper, Za’atar, and Flatbread (8/10). 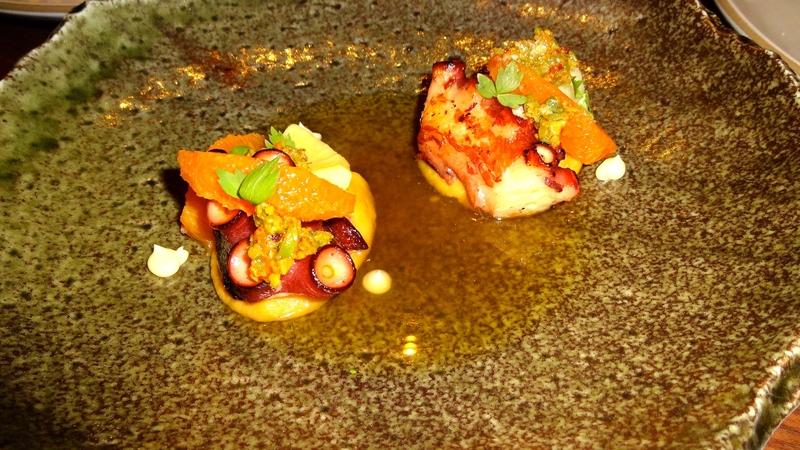 Octopus, Chickpea, Artichoke, Orange, Olive, and Merguez (7/10). 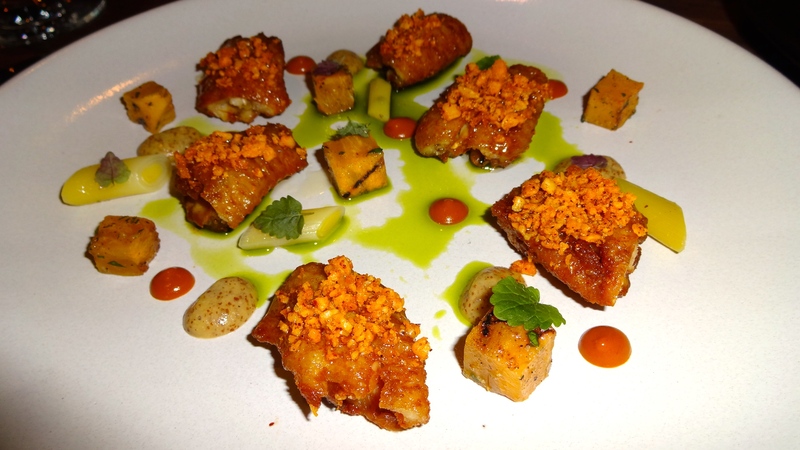 Chicken Wings, Persimmon, Almond, Mustard, Green Garlic, and Honey (8.5-9/10). Duck Confit Basteeya, Endive, Pear, and Verjus (8.5-9/10). Branzino, Potato, Cabbage, Cranberry, and Mussel Emulsion (8.5-9/10). Rib-eye Steak, Fregola, Nettle, Celery Root, and Maitake Mushrooms (8/10). 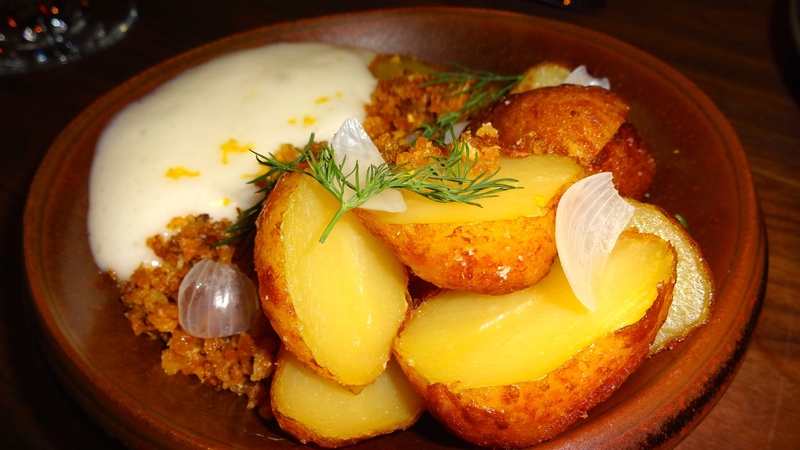 Potatoes, Potato Skin Crumble, Pickled Onions, and Buttermilk Foam (8/10). 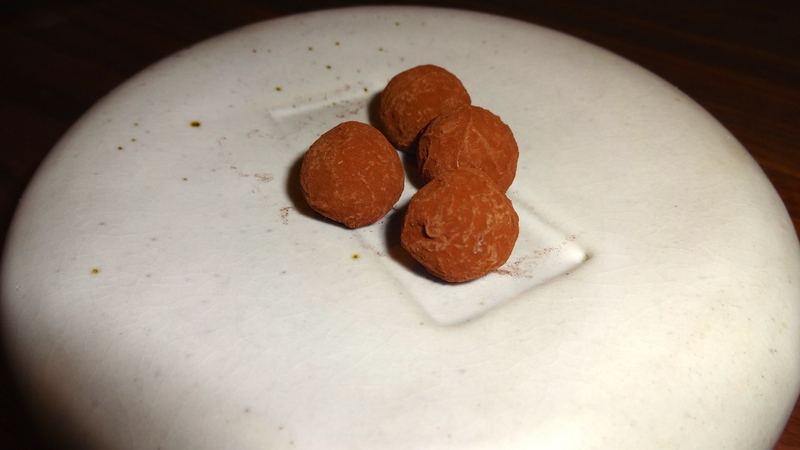 Walnut, Yuzu, Date, and Coffee (8/10). 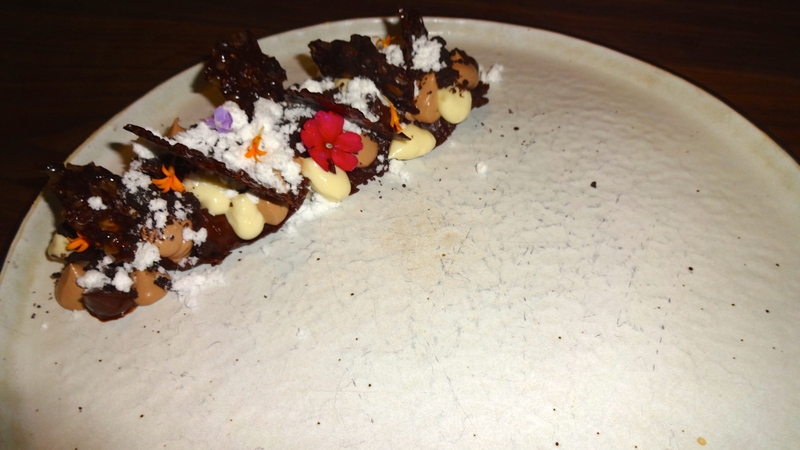 Chocolate, Ginger, Jasmine, and Ganache (7/10). 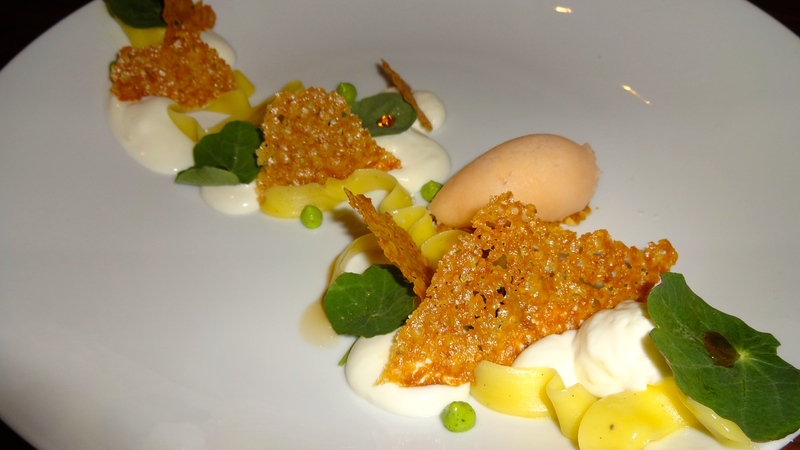 Olive Oil, Goat Cheese, Grapefruit Sorbet, and Nasturtium (7.5-8/10). Mourad has been one of my top dining experiences since being back in the Bay Area. First, the presentation of every dish was absolutely stunning and after all you do eat with your eyes first. Every single dish had beautifully plated food with creative flavor combinations that tasted divine. 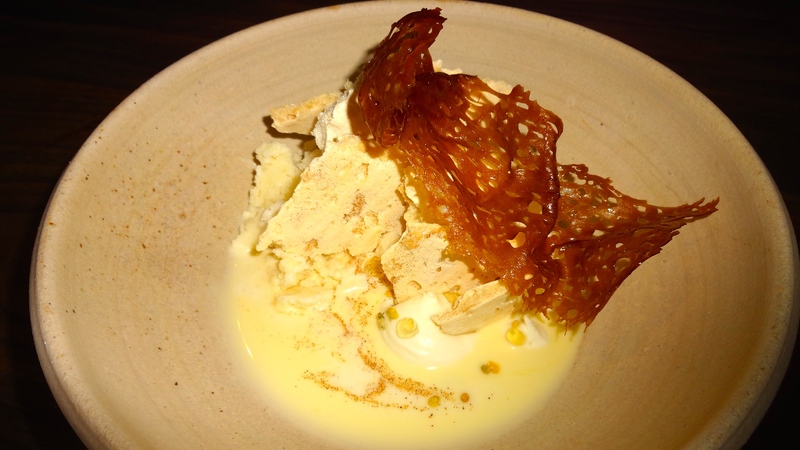 Highlights of the meal were the chicken wings, basteeya, branzino, and the “honey and almond” dessert. The deboned and glazed chicken wings were moist and tender and paired perfectly with the sweet persimmon and spicy mustard. I had tried the duck confit basteeya at Aziza and loved it so I knew I had to try it at Mourad. Their version of basteeya, also called bisteeya/pastilla, was a modern take on a traditional Moroccan dish which typically has squab or chicken meat with numerous spices wrapped in phyllo dough. 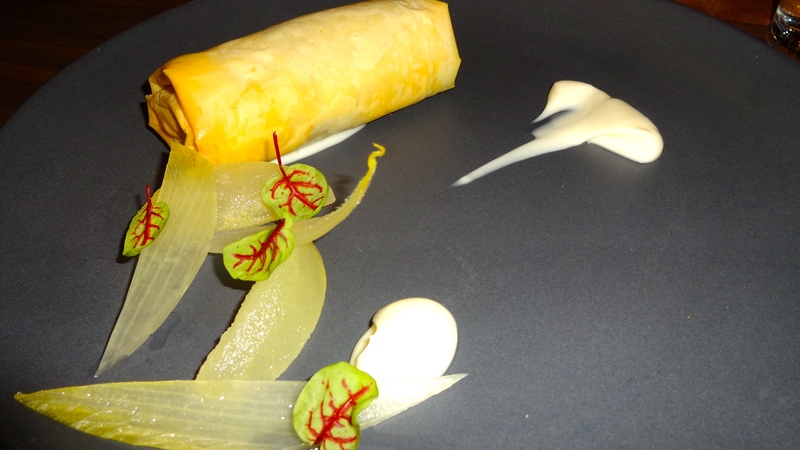 The duck confit basteeya was executed perfectly with tender spiced meat and crispy phyllo dough served with a delicious creamy sauce flavored with verjus, an acidic juice made from unripe grapes. Next, the branzino, Mediterranean sea bass, was an excellent entrée. 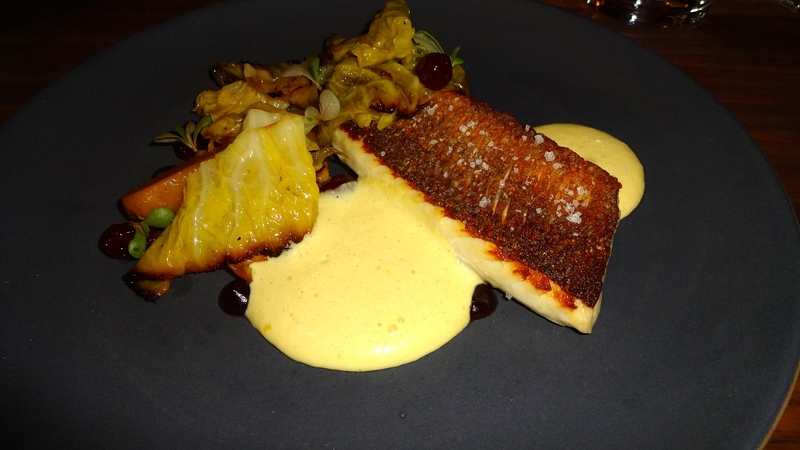 Perfectly cooked fish with a crispy skin served with smoked potatoes (fantastic), braised cabbage, sweet yet tart cranberries, and a light yet luscious mussel emulsion sauce. Amazing! 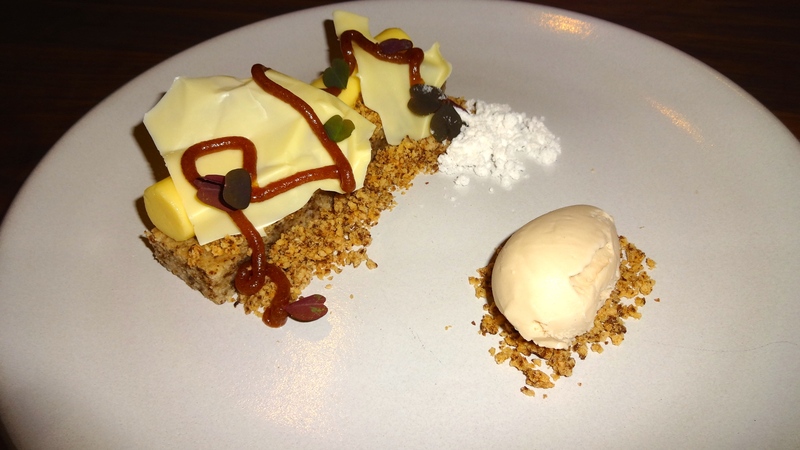 Lastly, the “honey and almond” dessert was extremely creative with pieces of airy crunchy honeycomb, refreshing granita, and a sauce flavored with orange blossom. 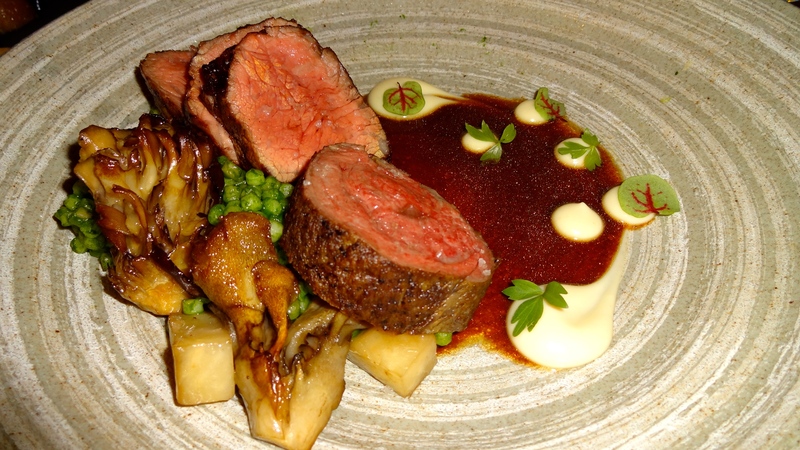 Overall, Mourad served outstanding innovative and delicious food so my rating is a 8.5-9/10. I would highly recommend Mourad for a great dinner out in a swanky restaurant for adventurous eaters! Review: KEIKO à Nob Hill. Pingback: Review: Mourad 2.0. – Sale, Pepe, Amore.